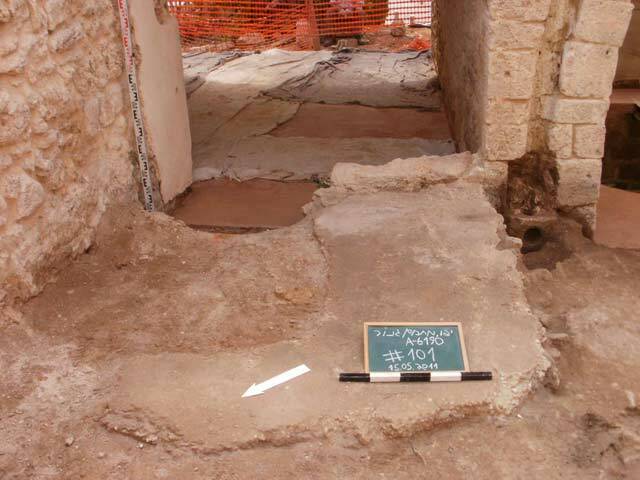 During May 2011, a salvage excavation was conducted in the Ganor Compound in Yafo (Permit No. A-6190; map ref. 177016–27/662232–41), prior to conservation work. The excavation, undertaken on behalf of the Israel Antiquities Authority and underwritten by the Garden Houses for Rent Company, Ltd. and Gav-Ari Development and Investments Company, Ltd., was directed by L. Rauchberger (field photography), with the assistance of Y. Amrani and Y. Lavan (administration), M. Kunin (surveying and drafting), H. Ben-Ari (GPS), S. Yehielov (preliminary inspections), E. Yannai (pottery reading), M. Shuiskaya (pottery drawing), Y. Kupershmidt (metallurgical laboratory), B. Antin (plans), D.T. Ariel (numismatics), Y. Arbel (identification of stone object), F. Milstein and A. Sasson (architectural consultation), M. Ajami, D. Barkan, E. Jakoel (Tel Aviv district), P. and D. Amir (volunteers) and J. Shwarz. The Ganor Compound is located along the eastern fringes of Tel Yafo. Beginning in 1994 numerous excavations have been conducted in the compound, adding much information with regard to the extent of Yafo, its industrial regions and the cemeteries from the Late Bronze Age until the Ottoman period (HA-ESI 121). A well-house consisting of four rooms and two pools is located on the eastern boundary of the compound; the well is in one of the rooms. The well-house was first marked on the Sandel Map from 1878/9. Sometime between the years 1920 and 1940 an iron saqiya, which was turned by a camel and provided water to an orchard planted nearby, was installed above the well, and one of the pools was built (the orchard was uprooted in 1970; Avitsur S. 1994. Installations in Their Landscapes, Chapters in the Industrial Archaeology in the Land of Israel. Tel Aviv. P. 239. [Hebrew]). The iron Saqiya operated till 1940. 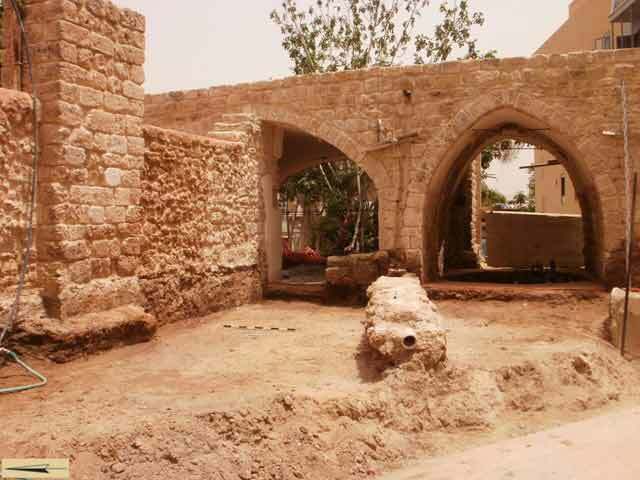 An excavation conducted close to the well-house in 2006 revealed architectural remains from the Early Islamic and Crusader periods, as well as a damaged channel that was connected to the well. Several fragments of pottery vessels that dated to the Ottoman period were discovered inside and around the channel (HA-ESI 120). A trapezoidal excavation area (24.5 sq m; Figs. 1, 2) was opened in the northern part of the saqiya plaza located in the western façade of the well-house. Part of the system for draining rainwater and architectural remains connected to the well-house were exposed. Prior to the excavation, a section of a drainage pipe composed of terracotta sections (diam. 9 cm, preserved length 4.8 m) was discerned on the surface, lying inside a casing of stones and plaster (L102). A section of a concrete floor (L101) was also noted at that time. The western end of the drainage pipe protruded from the casing, whereas the eastern end of the pipe was broken. While cleaning the pipe casing, a square kurkar stone (0.22×0.24 m; Fig. 3) was exposed near its eastern end. Two round holes were hewn in the stone, one in its upper side (diam. 9 cm) and the other in its front (diam. 10 cm). This square stone was placed beneath a gutter hewn in a pillar between the two middle rooms of the well-house. The water that flowed in the gutter drained into the upper hole in the stone and flowed on to the terracotta pipe via the hole in the front side. There was a hewn groove (depth 0.5 cm) in the hole in the front side of the stone, which was meant for connecting the terracotta pipe to the stone. A section of the concrete floor was cleaned (thickness 7 cm; Fig. 4) just north of the drainage pipe. Gravel was discerned among the ingredients of the concrete. The floor abutted a wall that was built of kurkar ashlars (W107; preserved height 0.4 m). The wall blocked part of the facade of the room adjacent to the well-room and it is therefore clear it was built in a later phase. The concrete floor and the wall were probably constructed after the original activity in the building of irrigating the orchard was suspended. A foundation of a pillar (L110; thickness 0.14 m) engaged in the side of a pool was exposed in the excavation north of the drainage pipe. The foundation protruded c. 0.25 m from the pillar, which had been used in the past to reinforce a beam that supported the saqiya wheels. Brown soil fill (L100, L103–L106, L108, L109) was exposed on both sides of the drainage pipe. The fill contained ceramic finds that mostly dated to the Late Ottoman period, including a large quantity of potsherds of brown clay and gray and black potsherds of Gaza ware, brown-slipped fragments of smoking pipes, pieces of porcelain vessels, body fragments of saqiya jars (Fig. 5:1, 2) and pieces of Marseilles roof tiles. Other finds included a body fragment of an imported Cypriote pithos from the Abbasid period, several fragments of bowl bases from the Crusader period and a rim fragment of a marble basin that was carved into a Corinthian capital, which might date to the Crusader period. A bronze coin from the Byzantine period (335–341 CE; IAA 140588) was discovered in the soil fill north of the terracotta pipe (L108). It should be mentioned that the brown soil fill was not sealed and modern disturbances were noted in it. Fragments of saqiya jars were discovered in the area of the well. E.J. Stern dated similar vessels in ‘Akko to the late eighteenth–early nineteenth centuries CE (‘Atiqot 31:65–68, Fig. 18:134, 135). In my opinion, the saqiye vessels discovered in the excavation can be dated to the time between 1920 and 1940, the period when the well-house had operated by saqiya installation. E.J. Stern ascribes the vessels from ‘Akko to a ‘proto-antila’ installation that was operated by the power of man. A contrasting contention was raised by S. Avitsur who claimed that saqiye vessels were used in all kinds of saqiya installations (S. Avitsur 1976. Man and His Work, Historical Atlas of Tools and Workshops in the Holy Land. Jerusalem, pp. 60–63 [Hebrew]) and could therefore have been used in the saqiya installation that was run in the well-house in the Ganor Compound and was turned by a camel. 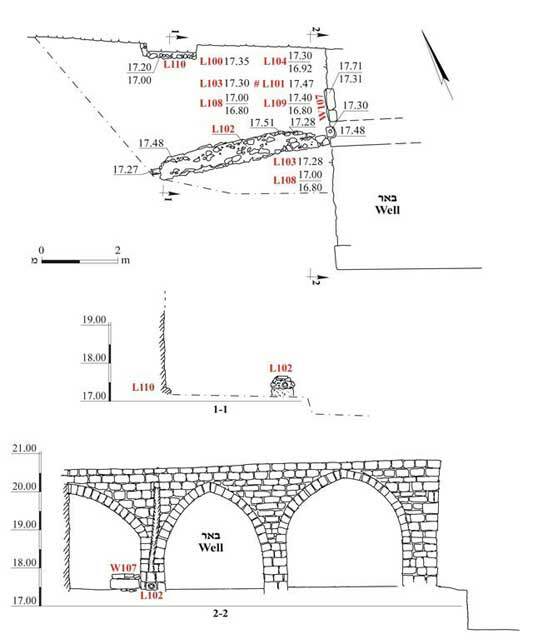 The volume of the saqiya vessels from ‘Akko (two liters) also casts doubt on the assumption that they were used in a saqiya operated by a man (E. Ayalon and Y. Drey 2005. 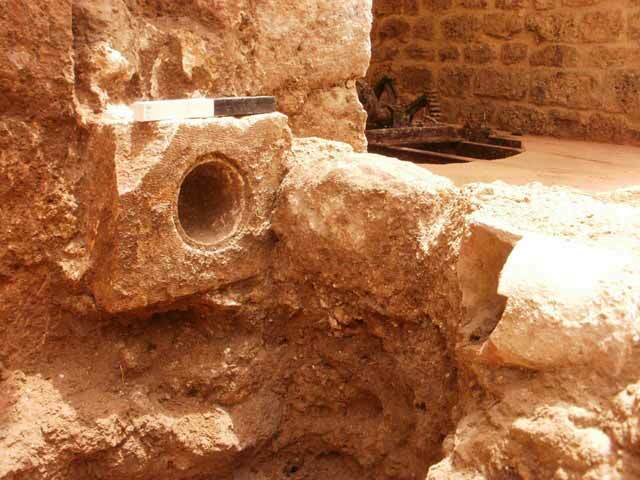 An Irrigation of System from Byzantine Yavneh-Yam. In M. Fischer [ed.] Yavneh, Yavneh-Yam and their Neighborhood, Studies in the Archaeology and History of the Judean Coastal Plain. Tel Aviv. Pp. 247–248, Fig. 19:8, 9). The importance of the excavation is that the rainwater drainage system of the well-house was completely exposed. In the wake of the excavation, the drainage system has been included in the conservation of the site. In addition, and based on the excavation, it has been suggested that saqiya vessels continued to be used until 1940. 2. The excavation area, looking east. 3. A stone with hewn holes that connected the gutter to the drain pipe, looking south. 4. A concrete floor abutting a wall, looking east.